In a press conference Thursday afternoon, Boston Mayor Marty Walsh announced that the City of Boston had filed a lawsuit against more than a dozen opioid manufacturers and distributors. The City of Boston has filed litigation against 13 opioid manufacturers, four pharmaceutical distributors and a New England doctor, Fathallah Mashali, for their alleged involvement in the misleading marketing and distributing of opioids, Mayor Martin Walsh announced at a press conference Thursday. 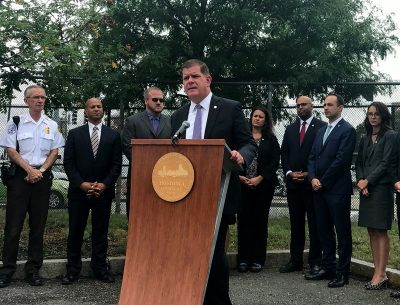 Walsh conducted the press conference along the “Methadone Mile” — a section of Massachusetts Avenue known for a variety of drug treatment centers, including Boston Medical Center. And, in its wake, a high concentration of drug users. “Methadone Mile,” which has more recently been nicknamed “Recovery Mile” after all the work Boston has done to rehabilitate the area, has been a glaring symbol of the persistent opioid epidemic. It was there that Walsh decided to share the news of his litigation, which he said represents a step forward in the City’s fight against the opioid crisis. The press conference focused on the City’s plans to expand recovery services and hold pharmaceutical companies accountable. “All of these companies and the people behind these companies have played a major role in creating the substance abuse crisis that we’re seeing today,” Walsh said. The City has spent an estimated $64 million on combating local opioid addiction over the last four years and is seeking $65 million in the lawsuit, according to Walsh. The goal of the litigation, he said, is not about money, but saving lives. This announcement came two days after the release of a new study by the Harvard Medical School and the RAND Corporation, which found that over 30 percent of outpatient opioid prescriptions in the U.S.may be written for no clear medical reason. In each of these cases, there was zero documentation of pain or a painful medical condition, the study reported. Tisamarie Sherry, an author of the study and associate physician policy researcher at the RAND Corporation, wrote in an email that they found that opioid prescriptions were written at a resounding 809 million offices around the U.S. between 2006 and 2015. Sherry explained that the results of the study make a strong case for further research in the domain of addiction. 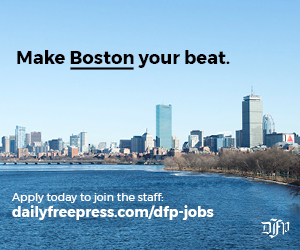 In Boston alone, an average of 457 milligrams of oxycodone were distributed per resident — double the state average and almost three times the national average. One affected resident was Jared Owen, a former opioid addict and current communications coordinator for the Massachusetts Organization for Addiction Recovery. Owen was 14 years old when he was first prescribed painkillers. After five grueling years of recovery, Owen said he wants the doctors, manufacturers and distributors responsible for advancing the opioid epidemic to be held accountable. In addition to the City’s litigation, Attorney General Maura Healey is partnering with officials in 40 states to develop innovative initiatives meant to counter the widespread opioid epidemic, according to Walsh. The goal, he explained, is to not only hold pharmaceutical companies accountable, but to also reduce the stigma around seeking treatment. As a recovering alcoholic himself, Walsh concluded the press conference by urging those battling addiction to ask for help and remain hopeful.